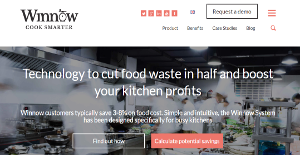 Winnow is a cutting-edge restaurant management technology that aims to help the hospitality sector reduce their food waste. The application allows restaurants, cafeterias, and other food establishments to see in accurate detail the waste they generate. Unlike other restaurant-centered applications with back-office and front-of-house management, Winnow is dedicated for kitchen use alone. It weighs, identifies, and tracks the establishment’s food waste. A waste bin is placed atop a weighing scale with a screen attached to the top. The application then weighs the food thrown into the bin and prompts the user to identify what kind it is via the touch screen. Winnow records the log from the scales into the cloud and sends a report to the manager at the end of the day. These daily reports are actionable and gives food businesses an insight on how they can reduce food waste and increase their profitability. Winnow does not require complicated installations in restaurant’s systems. A waste bin only needs to be placed atop it and with a few taps from staff, it does the rest. Kitchens are hectic places but with its easy-to-use system, staff can quickly input the kind of food they are throwing away. Winnow automatically analyzes food waste data that is stored in its cloud-based system. It then generates a daily report that it sends to the manager’s inbox which they can work on for a doable solution to decrease their wastage. Through this, the establishment can see a rapid return on their investments, thus making their business more profitable. With Winnow, chefs can take greater control of what goes on in the kitchen. The application’s cloud-based reporting will allow them to identify which foods generate the most waste. These can be foods that are not as bestselling with diners or they can be results of kitchen accidents like spilling. Whatever the cause, chefs can immediately act on those and find ways they can reduce their waste. Winnow can make chefs more creative, too. With budget restrictions less tight due to better food waste management, chefs can come up with more menu ideas to offer their clientele. Winnow offers full support to users from setup to waste management tactics. This will relieve head chefs from organizing the menu on the system and training the kitchen staff on how to use it. Winnow ensures as well that head chefs fully know how to analyze the reports generated by the system, so that they can implement more efficient kitchen practices. If you are considering Winnow it might also be beneficial to examine other subcategories of Best Restaurant Management Software gathered in our base of B2B software reviews. Companies have unique needs and requirements and no software platform can be just right in such a situation. It is futile to try to find a perfect off-the-shelf software app that meets all your business needs. The intelligent thing to do would be to modify the system for your specific wants, employee skill levels, budget, and other elements. For these reasons, do not hasten and pay for well-publicized trendy systems. Though these may be widely used, they may not be the perfect fit for your unique needs. Do your groundwork, investigate each short-listed system in detail, read a few Winnow reviews, call the vendor for clarifications, and finally select the app that offers what you need. How Much Does Winnow Cost? We realize that when you make a decision to buy Restaurant Management Software it’s important not only to see how experts evaluate it in their reviews, but also to find out if the real people and companies that buy it are actually satisfied with the product. That’s why we’ve created our behavior-based Customer Satisfaction Algorithm™ that gathers customer reviews, comments and Winnow reviews across a wide range of social media sites. The data is then presented in an easy to digest form showing how many people had positive and negative experience with Winnow. With that information at hand you should be equipped to make an informed buying decision that you won’t regret. What are Winnow pricing details? What integrations are available for Winnow? If you need more information about Winnow or you simply have a question let us know what you need and we’ll forward your request directly to the vendor.